Wow I feel so loved! I received another blog award this week from two amazing bloggers, Roam where you want to & The Stylish Shoe Girl. Roam where you want to's blog is full of delicious recipes and inspiring outfit ideas. You should definitely check out her blog. The Stylish Shoe Girl shares her travels and experiences with you, it’s almost like you’re there with her! I love escaping into her fabulous world and I’m sure you will too! 3. I ALWAYS have to colour-code my pegs (when I hang out the washing) and when I put something in the microwave the numbers have to be the same (eg. For 1 min I’d put it in for 111, for 2 mins I’d put it in for 222). Weird right? 6. I am a sugar-free redbull addict! I have 1 a day every weekday at 9am! 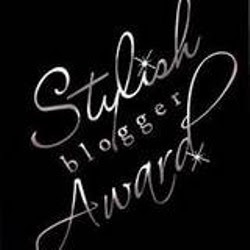 Now I get to pass this stylish blogger award on to 15 other divine bloggers. Congratulations to all of you and keep up the great work on your fantastic blogs. In total agreement with you about the spaghetti bolognaise. Yummo! Interesting answers. I can't believe you own a house! Good for you. So glad you're getting lots of love! aww thanks lovely, ill get around to reposting this sometime! im yet to do my other one from christie. im the same with numbers on things, my boyfriend intentionally puts the tv on an annoying number like 17 and i crack haha! When's the day you start again? My everything depends on you.. Paint me a blue sky..